Now that the results for the CAT 2018 Exam are declared, one of the most common questions that I get from students is which colleges can I apply to and which colleges can I get a call from. While there are no hard and fast rules to such things, I have still tried to compile a list of colleges that you can and should apply to. In case you have already applied to some of them, you will be able to access if you stand a chance at getting calls from any of those colleges. I will be talking about the non IIM colleges in this blogpost. Also, there is still time left to apply for Post Graduate Program in Business Analytics by IIT Kharagpur + IIM- C + ISI. 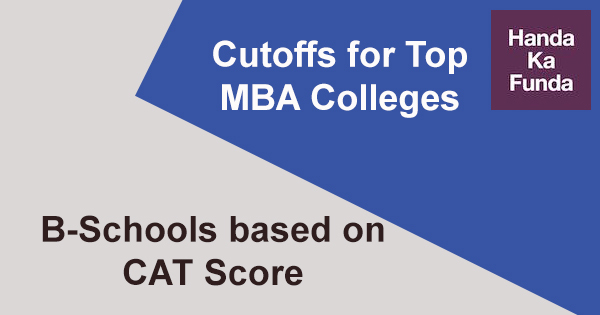 Cutoffs for all IITs are typically more than 95. Roorkee, Kanpur, Madras are typically lower (around 96) while it is higher for Delhi and Bombay. For IIT-B, it can go up to as high as 99. The application for most IITs will start this week. Cutoffs for FMS and SP Jain are typically in the 97-98 range. When I am talking about SP Jain, I am talking about the non-profile based calls. Cutoffs for MDI and NITIE are typically around 95-96. IMT Gaziabad and IMI New Delhi are couple of good options in this category. MBA (IB) and MBA (HRD) from Delhi School of Economics are really good options for CAT aspirants with scores in the 90-95 range. The fees is next to nothing for these and it should be on the radar of every CAT 2018 aspirant who is looking for a good education at a low price. FORE school of Management is my personal favorite in this category. It typically has cutoff in the mid 80s. NIRMA is also a good option with cutoff around 80. UBS Chandigarh is also a decent choice and so is K K Somaiya. BIM Trichy could also be one of your options. Should you try for CAT 2019? To be honest, if you are looking at colleges in this category – there isn’t too much that separates these colleges. There is not going to be a significant difference in terms of brand value in these colleges. If you are worried about placements, well – you should be. But to be honest – the B-school is not going to define your placement. It is what you are going to do in the two years in the college, that will have the maximum amount of impact. Ask yourself the following questions and based upon that decide whether you should join one of these colleges or not. You should join one of these colleges if and only if your answer is YES to all of the above questions. If not, you should seriously think about giving it another shot.